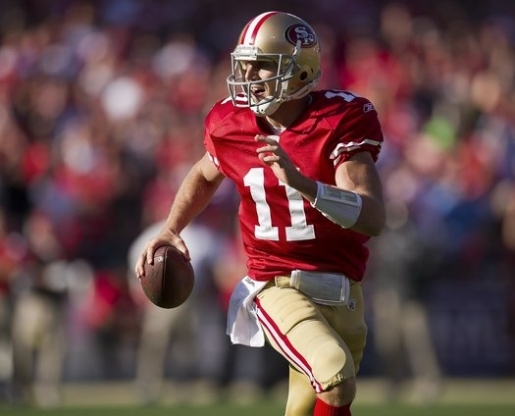 In 2005, Alex Smith went from starring at the University of Utah to being the top pick in the NFL draft, picked by the prestigious San Francisco 49ers. After that, though, he may as well have been with a new team every year, despite not moving actual location. The Niners went through a different offensive coordinator and coach combo multiple times, and Smith never had a shot to get comfortable. Even after he got some stability, it didn’t last. Now he’s getting a chance to have a team of his own. Alex Smith has been traded from the San Francisco 49ers to the Kansas City Chiefs. Smith was the top rated passer in the NFL last season with a quarterback rating of 104.1. He completed more than 70 percent of his passes and was 6-2 before being given a concussion in November against the St. Louis Rams. By the time he recovered, Niners coach Jim Harbaugh had changed the team around to work with Colin Kaepernick. Despite losing his starting job, Smith remained a good teammate and mentor to Kaepernick and company as the team went to the Super Bowl. Now he’ll get a fresh start with new coach Andy Reid in KC.